Welcome to Custom Garage Works! 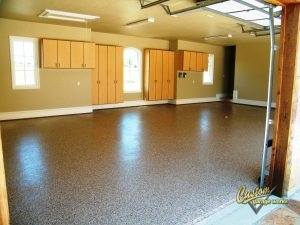 Recognized for our custom garage floor coating in Plano, TX, we first began our business in 2003. We decided to create the perfect garage for ourselves and our growing families, but when we couldn’t find what we were looking for within the current industry, we decided to jump in ourselves. Today, we offer some of the greatest garage storage cabinets in the industry, as well as high quality polyurea polyaspartic floor coatings that last decades longer than traditional epoxy floor coating. Our team is professional trained, and we are passionate about designing custom garages, with impressive garage floor coating results across DFW. 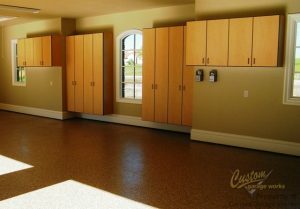 Our premium garage floor coating in Plano, TX is one of our most popular garage options! This boom in popularity is likely because our coatings are stronger than epoxy, and cure in a shorter amount of time, which means that you can use your garage within 24 hours in most scenarios. While with epoxy floor coatings, you need to avoid UV exposure and watch out for flaking, our polyurea-based floor coatings are significantly more durable. Since we choose to use a diamond grinder to prep the floor for coating, as opposed to acid etching, we can provide a higher quality end result. If you are interested in learning more about our garage floor coating service, you can schedule your free estimate when you call 214-494-9068 or 817-308-1305. Thanks to Custom Garage Works’ storage solutions, you won’t ever need to worry about running out of space in your garage again. The greatest custom garages have an organization method in place. With products such as garage cabinets and overhead storage racks, we have a variety of solutions for our clients’ garage organization needs. We provide some of the most resilient overhead storage racks in the industry, and our garage cabinets are specifically designed for garage needs. When you need a reliable garage floor coating in Plano, TX, and unbeatable organization solutions, you can count on Custom Garage Works. Overhead Storage Racks If you want to get more out of your overhead storage space, our durable storage racks are a great place to begin!